The statue is that of one of Zadar’s most illustrious sons – Spiridon Brusina. He was born here in 1845, and rose to fame as one of Croatia’s most eminent zoologists, and a malacologist of note. In plain English, the man knew his molluscs. 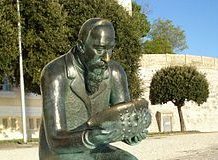 He was known to be the leading expert on living molluscs in Croatia, Dalmatia, and Slavonia, and decided early on that he would devote himself to the fauna of the Adriatic Sea. By the time of his death, he had compiled the most exhaustive collection of Adriatic fauna to date. 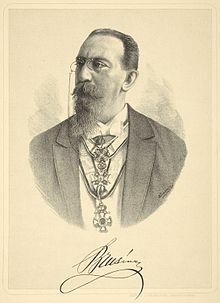 He also founded and headed the Croatian National Zoological Museum and the Croatian Natural History Society, and was a member of the Freemasons. It was therefore only fitting that the “Father of Croatian marine biology” be venerated thus. facing the waters whose depths he plumbed for knowledge his entire working life. The bronze rendition sits outside the University, at the end of the Riva, gazing with curiosity at an open conch shell.